I have just discovered that my 6xG Grandfather was Francis Jefferys, rector of St. Andrews from 1713 - 1740! His son-in-law, John Dupont who became his Curate, was my 5xG Grandfather who had married Francis’ daughter Frances. John later moved on to be the Vicar of Aysgarth from 1733 until his death in 1768. The Rev. John Duponts son (also John) joined the EIC Army and ended up as Lieutenant Colonel in command at Cuddalore. After him, I am the 6th generation in the family born in India, although I grew up in Rhodesia. I never thought that I would be able to trace the family history back further than India and I am absolutely thrilled with these discoveries. I will hope to visit Wimpole and Aysgarth very soon! If you can tell me anything at all about Francis I would be very grateful.. The old .co.uk and new .org sites will be run in parallel for the time being although you will probably find yourself switching between the two sites. If I manage the page links properly, the transition should be seamless. Eventually, the whole site will be transferred across to the .org domain. I actually lived in Arrington, but am familiar with all the names in the Wimpole Park School photos. Irene Lowe was in the same class as me and I knew both her sisters. My memory is fading now that I am approaching 80 but have fond memories of all the people in the photos and I can remember everyone of them. I remember Mr Jordon with his motorbike and sidecar. He used to take me to school cricket matches because Although I lived a mile away from the school I did not qualify for a school bike, so I travelled in the sidecar with all the equipment. I remember the American hospital well. When I was at Arrington school in 1944 I was running away from my older sister Betty who was trying to make me put my coat on and I ran into the road and was knocked over by a car. The American hospital ambulance pick me up and took me onto camp for assessment, they then took me to the old Addenbrookes hospital in Cambridge where I spent the next six weeks with a broken leg. 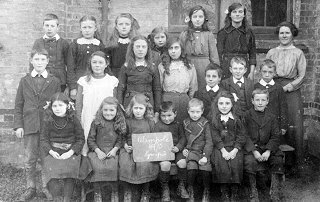 New Wimpole School page for 1915 added today. Six names: Ethel Skinner, Gladys Franklin, Eric Charter, Cyril Bullen, Ada Skinner and Ernest Bullen. The schoolmistress pictured is Mrs Newell. Since Dad (Micheal Skinner) passed away, this has been a link to be able to look back though our heritage. I hope you are able to continue to find more information, photos and stories. I am making contact regarding the photograph 'Wimpole Park Junior Pupils - Intake c1950'. I note the image was donated by John Pearce and the names are as remembered by John Pearce and Denis Tokley. 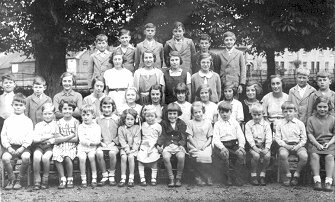 My name is John Sellers (DoB 27/03/1942).The group was at Arrington School, and I am the ‘boy’ in the photo standing in front of Miss Whitmore and beside Stanley Tokley. I was recovering from a head injury at the time, which was the reason for the pudding basin haircut! I believe the year was 1949. Sadly, my mother died of cancer in May that year. My father was a lecturer at the Emergency Teachers Training College, Wimpole Park. When the college closed in 1950 my family re-located to Cambridge where I went to Brunswick School and then The Perse School. I left school in 1960 having gained a commission into the Royal Navy and was selected for aircrew training. For the next 32 years I served in the Fleet Air Arm flying various types of helicopter and the Jetstream aircraft. Towards the end of my Service I was appointed MBE for services to Naval Aviation. It was all great fun, but when I reached my ‘sell by date’ (50th birthday) in 1992, and by which time I was a Lieutenant Commander, I had to retire. My first civilian job was Bursar at Douai School; an Independent School attached to a Benedictine Monastery situated in Berkshire. For the next 5 years my boss was a monk! In January 1998 I moved on, to work for Guide Dogs for the Blind Association as the Administration Manager at the Guide Dog Training Centre in Wokingham. In 2002 I moved on again to become Property Manager for James Cowper Kreston Accountants, responsible for the firms six offices located around the southern counties. I retired in 2012, just after my 70th birthday. I am married to Felicity, we live in a village close to Newbury, and have two adult children – Christopher and Juliet. 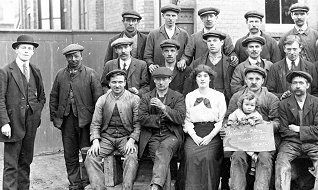 I have today added a new image page of Cundall's Employees photographed in 1915. The page includes the surprising life story of 'the girl in the picture'. I have today added an updated and extended page about the old brewery/factory building and the Cundall (Orwell) Folding Machine Co located in New Orwell (Wimpole) from 1908 to 1917. Includes six large photographs of employees and those engaged on war work. I have today added Part Three of my annotated 1901 Census. This page covers the 'New Orwell' properties in Cambridge Road, Wimpole. The two annotated 1901 Census pages have been completed. Part One covers the Wimpole Estate and Part Two mainly covers the village and farms along Cambridge Road. Thank you for putting the photographs of the Pratt family on your website. I am a descendant of Charlotte Pratt so am very interested in all the information you have on her! Two pages uploaded today: Marriages 1560-1599 and Marriages 1700-1799. The Marriage Register for Wimpole 1560 to 1863 is now complete. Thank you so much for all your hard work in creating a superb website. I discovered your original website some years ago and was so disappointed when it wasn't updated and some links were lost. Imagine my joy today when I discovered this new site! I am a descendent of the GOATES family and HAGGER, CHAPMAN, LONG and ELLIS families are all in my tree. Thank you, thank you, thank you Mr Odell. 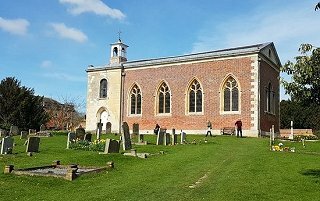 Uploaded today, a detailed look at the Chicheley Family entries in the Wimpole Parish Registers from 1560 to 1698, together with a speculative family tree. 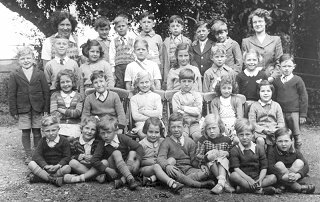 Uploaded today, a set of six pages on Wimpole Park School 1948-1955, including photographs with submitted names. Uploaded today - a group of Wimpole School pupils dating from October 1938. 36 pupils, 34 with names. I've now finished the Wimpole Burials 1560-1863. The two original pages were somewhat unwieldy so I've split them into four: 1560-1599, 1600-1699, 1700-1799 and 1800-1863. I also checked the listings on 'Wimpole Past' against a commercially available version of the parish registers and I was pleased (and relieved...) with their accuracy. The 'Wimpole Past' website now has a private Contact Form for e-mails, a public Guestbook (obviously) and a whole heap of shiny new Search Boxes, all ready to be used. And now the girls! 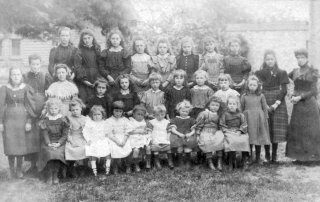 Go to the 1900 Schoolgirls page for the large image and for some suggested names.